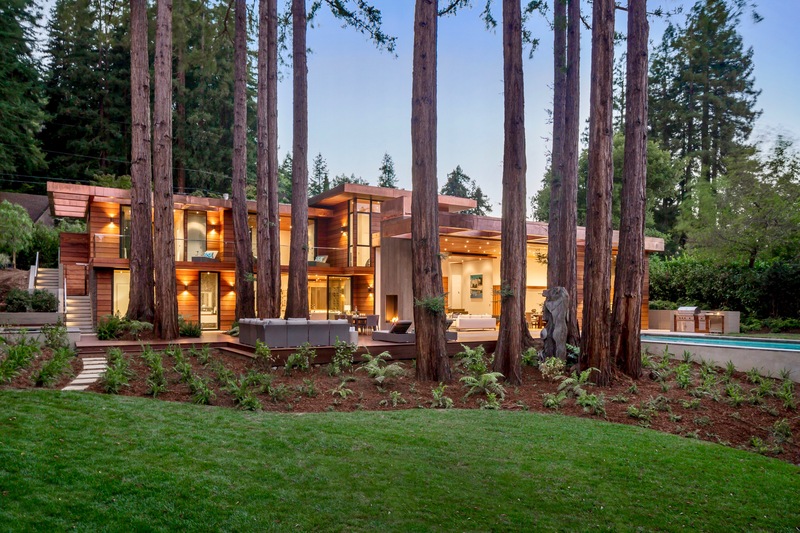 Ross, California is one of the most desirable communities in Marin County. This gated and private sanctuary is ideally located in the flats of Ross near Ross Commons and Ross School, which are just down the street. 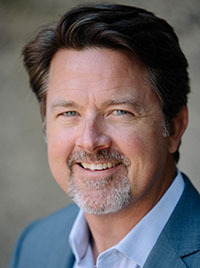 Branson School is only minutes away. Enjoy easy access to incredible natural resources including Phoenix Lake Park with its world-class hiking trails and inspiring vistas. 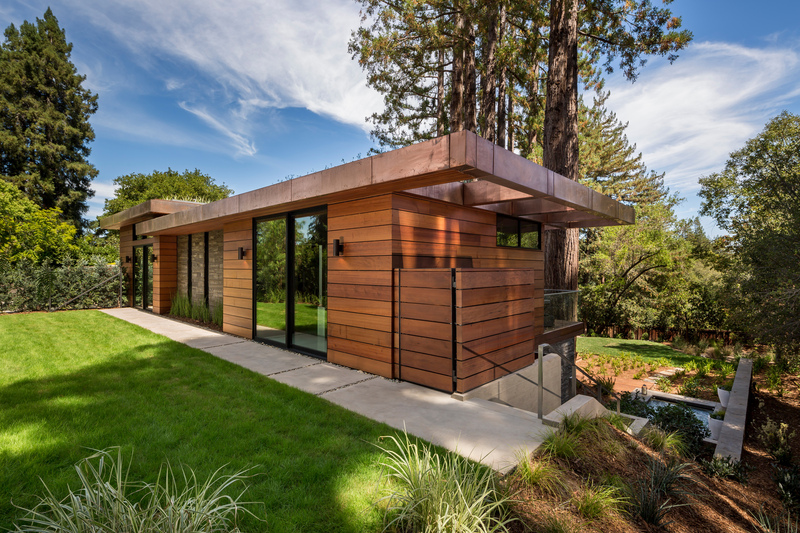 Residents of Ross cherish the lush greenery, wooded hills and beautifully landscaped streets of this special town. 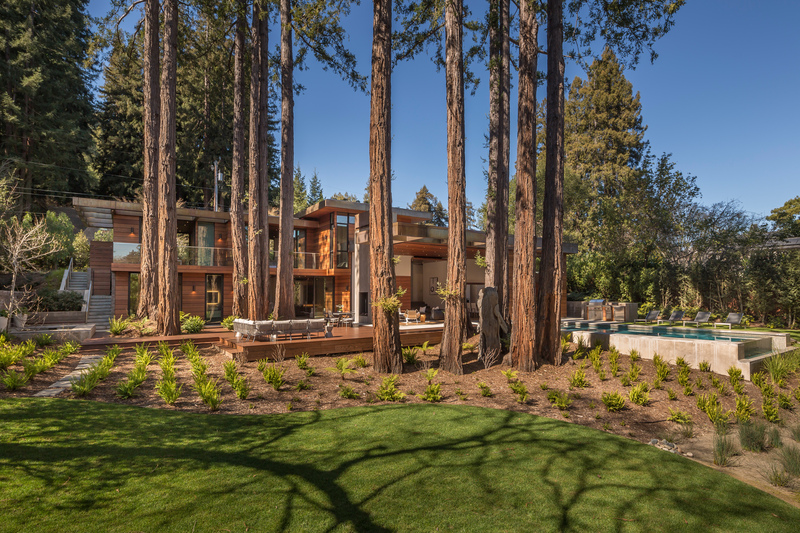 The existing scale and quality of architecture, along with a low density of development, create a community where man-made and natural environments co-exist in harmony. 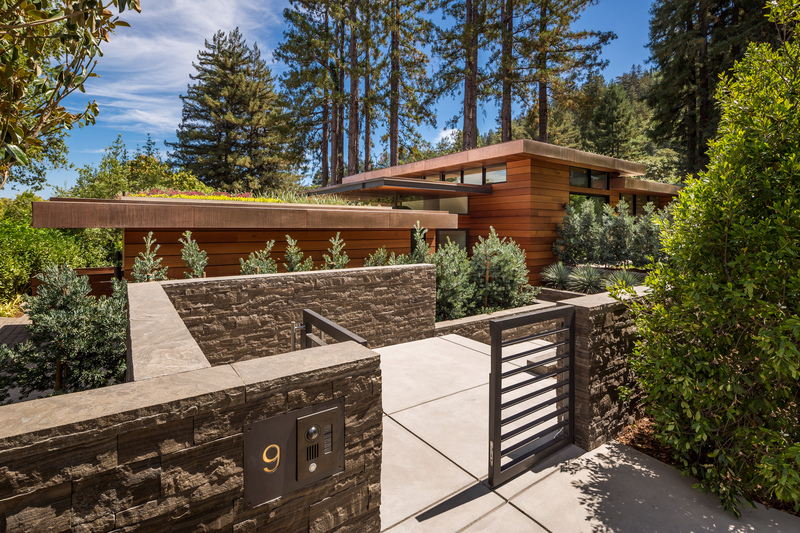 Entering the front gate at 9 Woodside Way and you know you have arrived somewhere special. 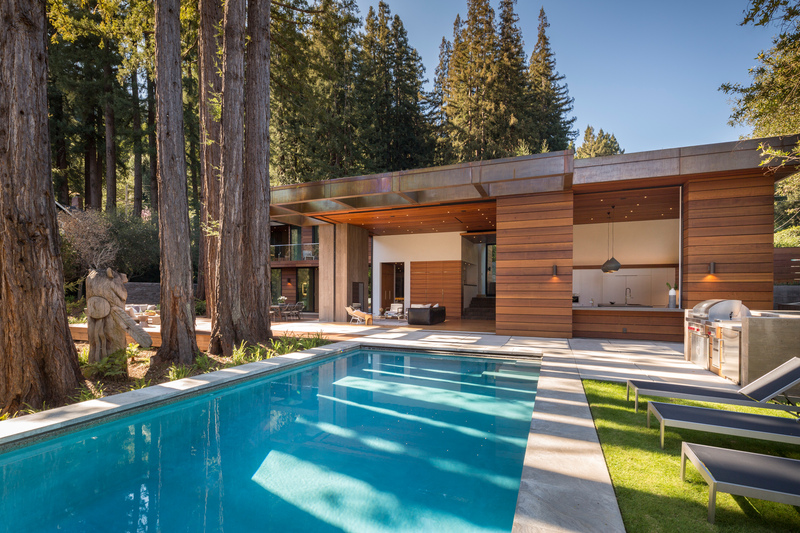 Sleek, staggered roof lines meet wide-plank horizontal siding of reclaimed old growth redwood that blends beautifully with stacked limestone accents. 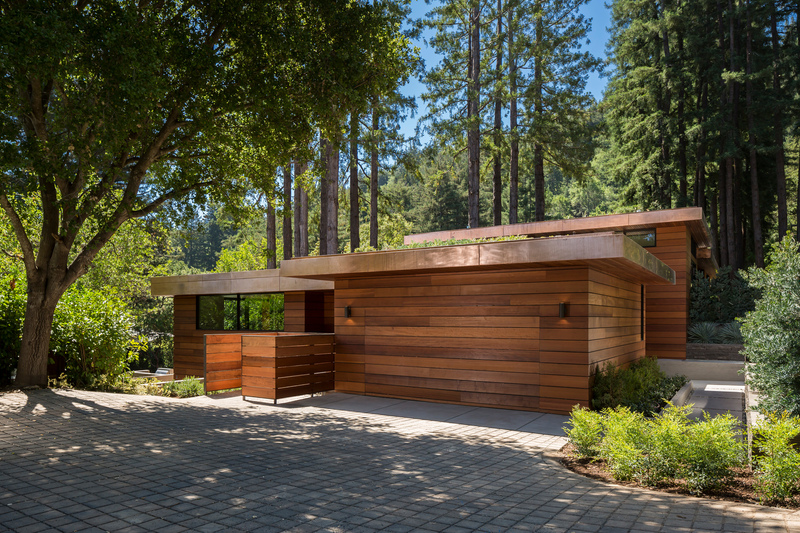 Copper clad fascia surrounds the roof line connecting to the living roof above. 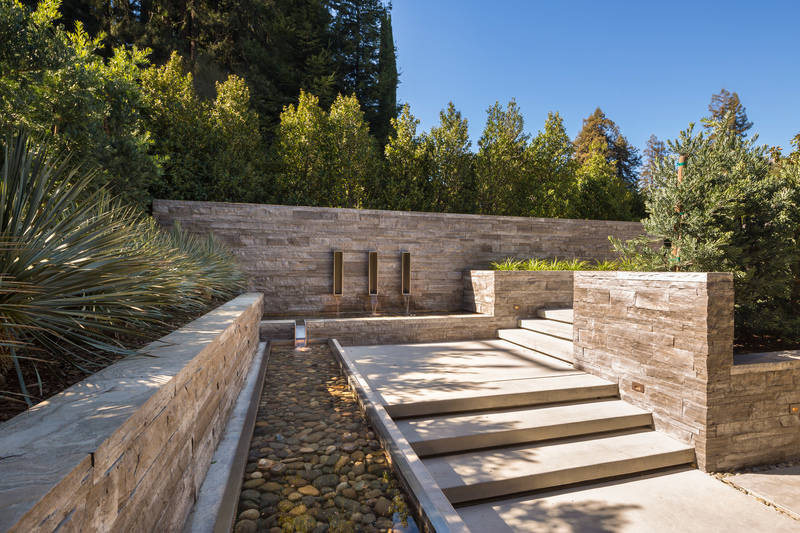 Stacked limestone walls and linear water features border the entry pathway that leads to the twelve-foot glass entry doors. 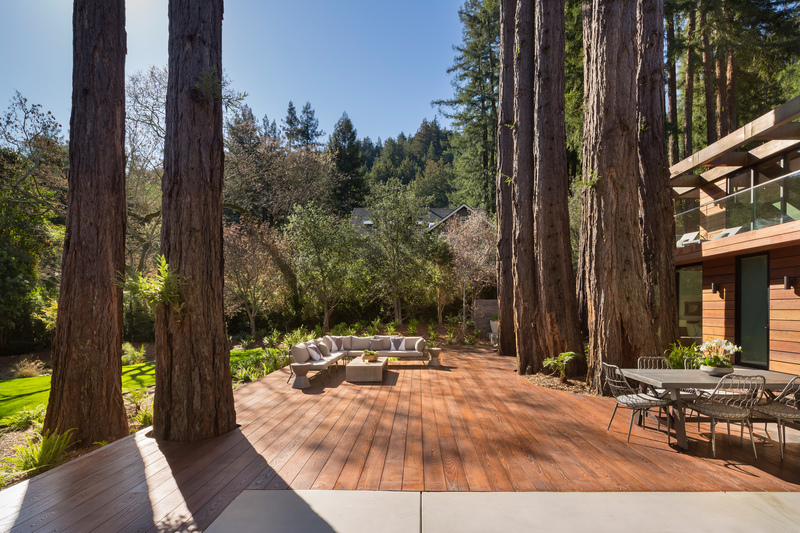 As you descend to the entryway landing the house starts to come to life as you gaze through the entry corridor and great room out to the pool, back yard and majestic redwoods beyond. 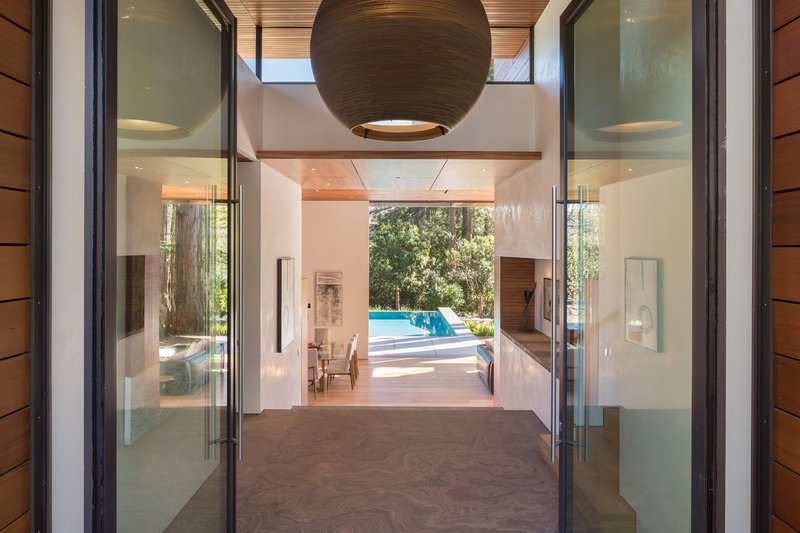 Passing through the entry you are introduced to an inspirational space with a scale and level of design rarely seen. 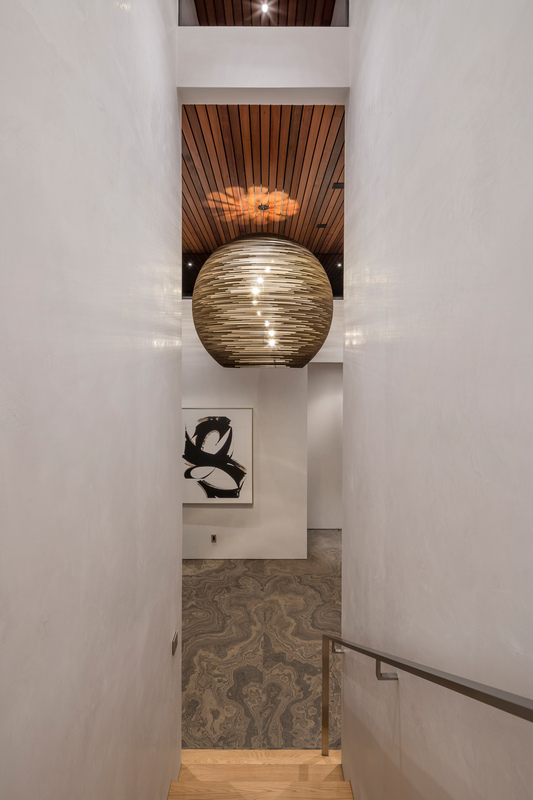 The entry hall floors are finished in slabs of imported swirl pattern grey limestone contrasted by Hawaiian Koa wood ceiling panels and polished white Venetian plaster walls. 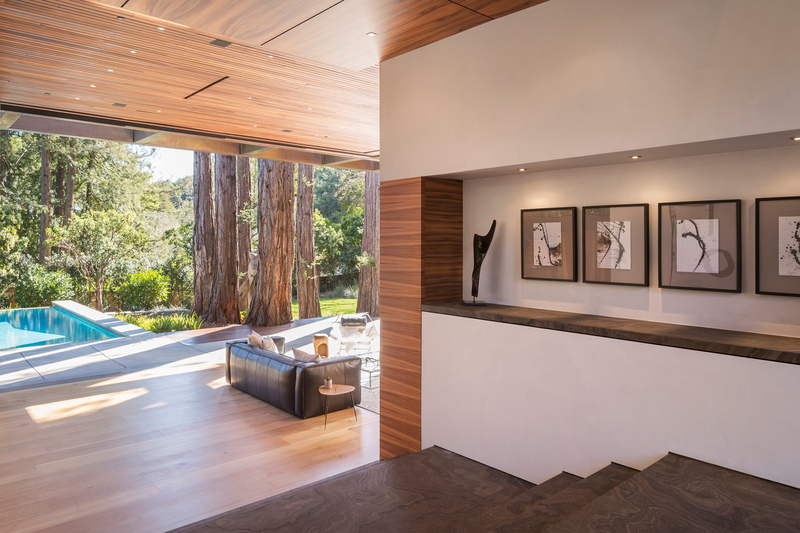 A stairway ascends from the entry hall to the upper bedroom level. 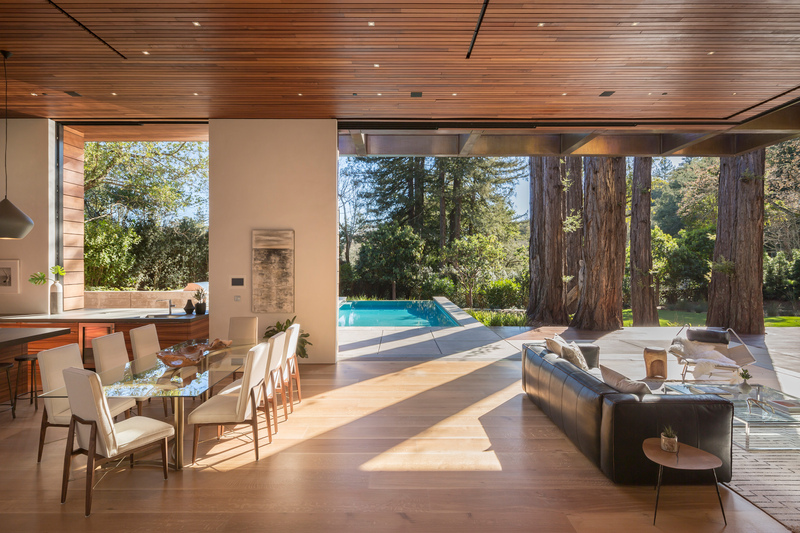 Step down into the boundless great room combining the kitchen, dining and living areas into one grand space. 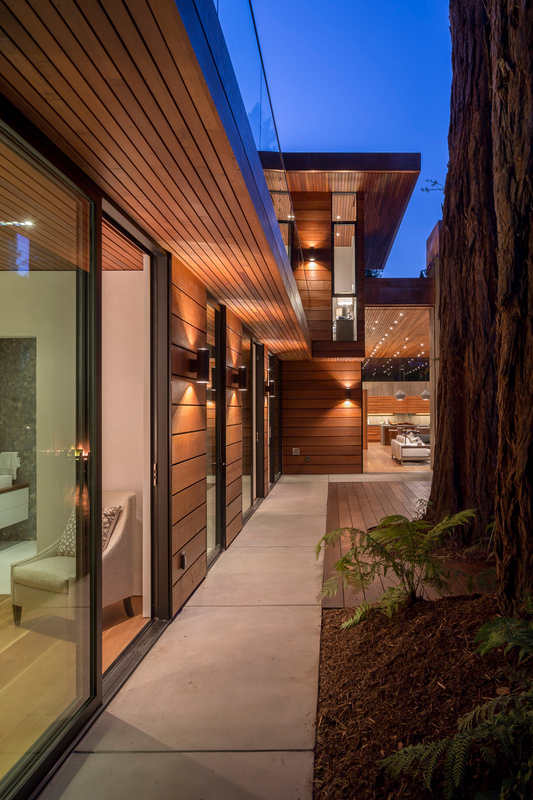 Sixteen-foot ceilings decked in reclaimed old-growth redwood warm the great volumes of this room. 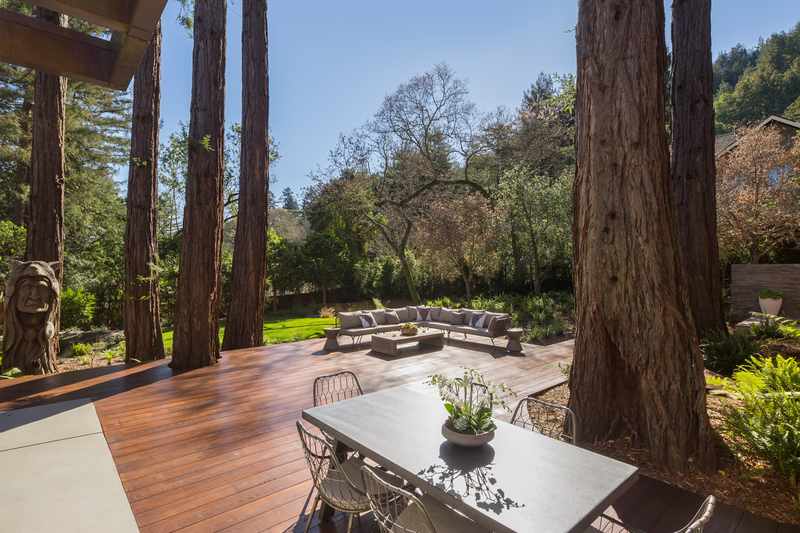 Wide-plank quarter-sawn oak floors finish the entire room and main level. 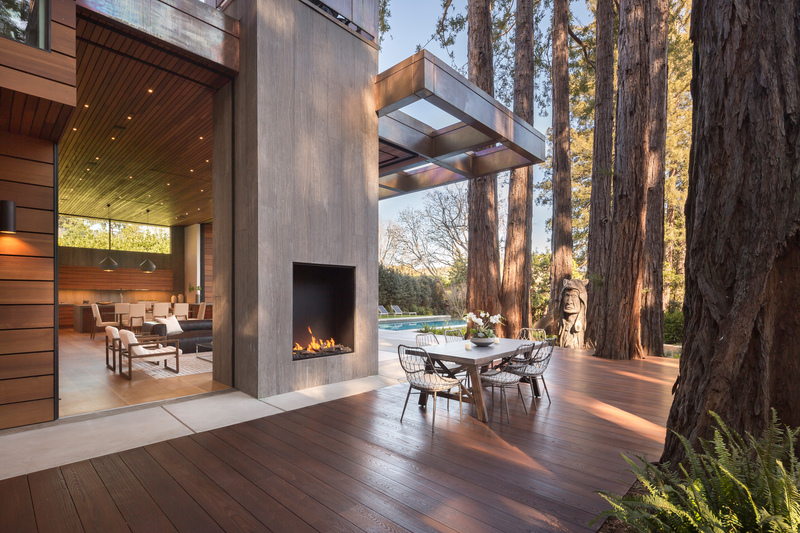 Sliding walls of glass reveal serene spaces outside. 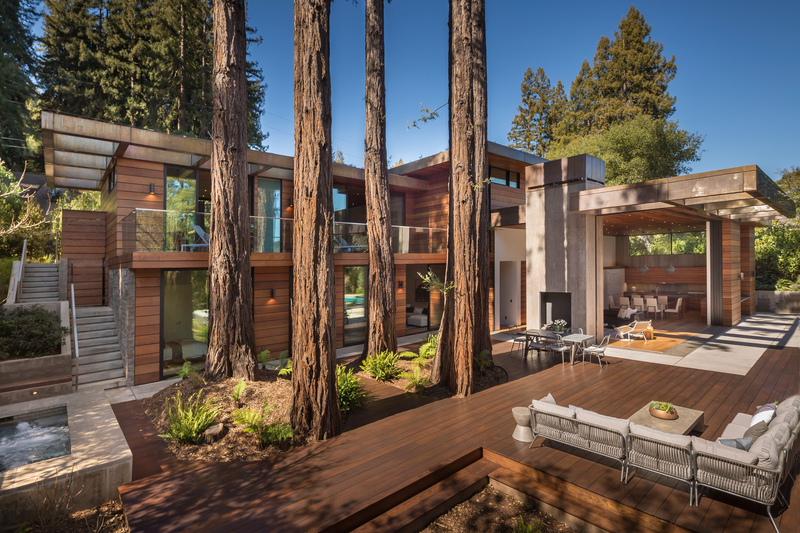 Thirteen mature redwood trees are the central point of this property, and all spaces were inspired by and flow gracefully around them. 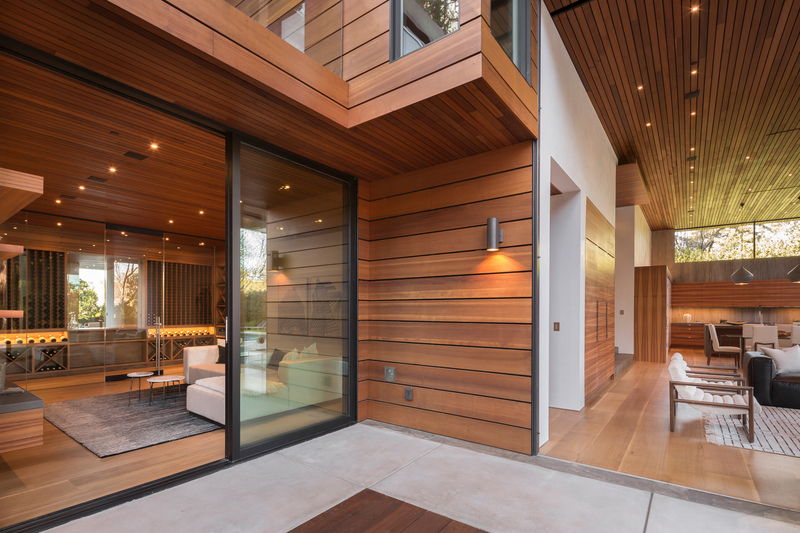 The sixteen-foot sliding glass pocket doors easily stow away, blurring the distinction between indoors and outdoors, bringing the redwood grove into the home. 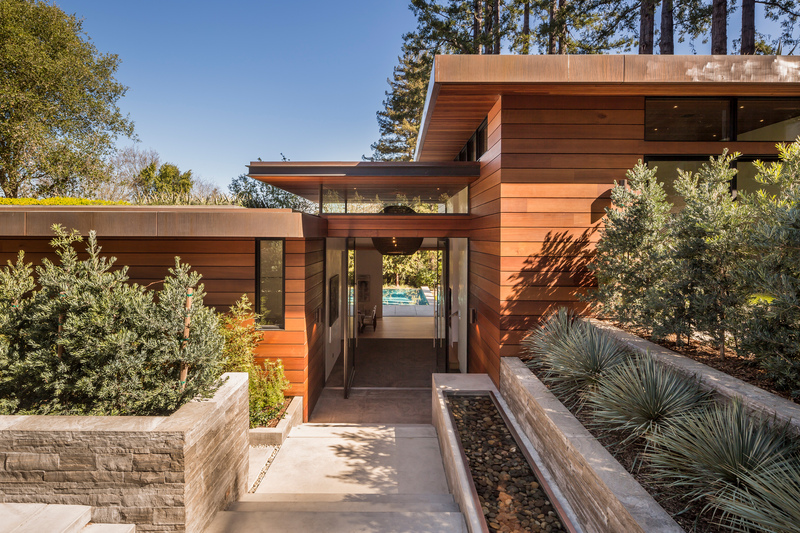 A broad, exterior copper clad trellis floats above the living spaces it contains giving a sense of being in the open, yet sheltered and protected. 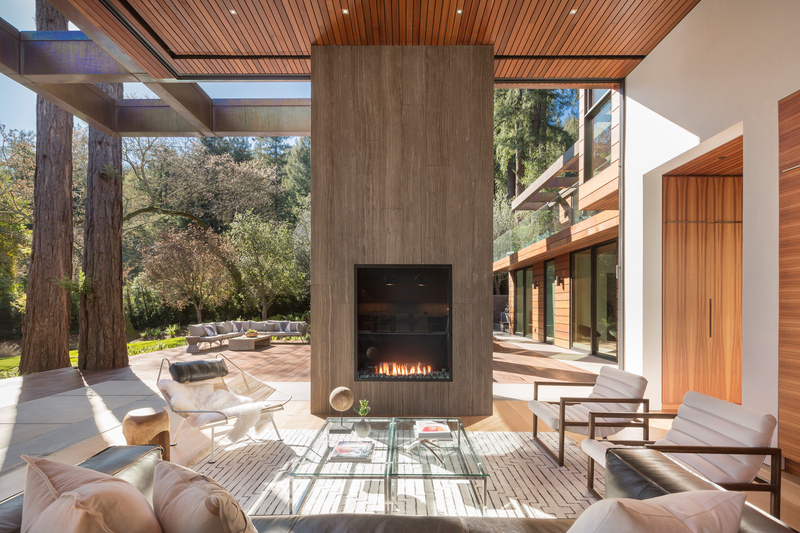 A dramatic floor to ceiling stand-alone wall of vertical pattern limestone frames the living area fireplace and echoes the texture of the redwoods outside. 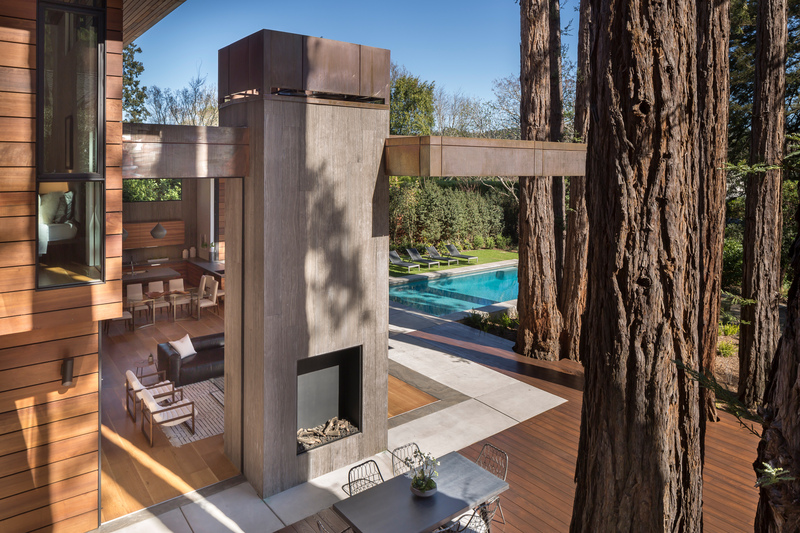 This handsome stone wraps around to the exterior of this monolithic wall creating a mirror image on the reverse wall with an outdoor fireplace. 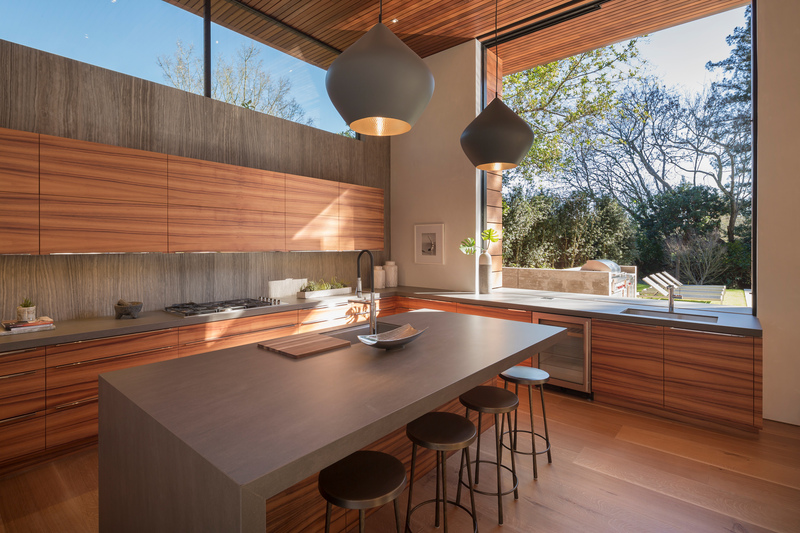 Outfitted for the professional chef, this incredible kitchen has an ideal layout with all Miele appliances including large matching refrigerator and freezer, six-burner gas stovetop, hidden dishwasher, wine refrigerator, coffee maker and microwave. 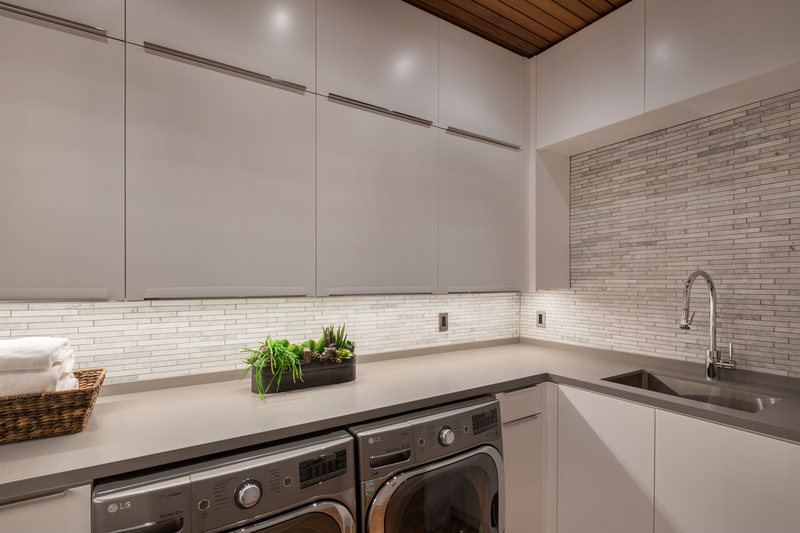 A limestone backsplash accent wall sets off custom Koa cabinetry. 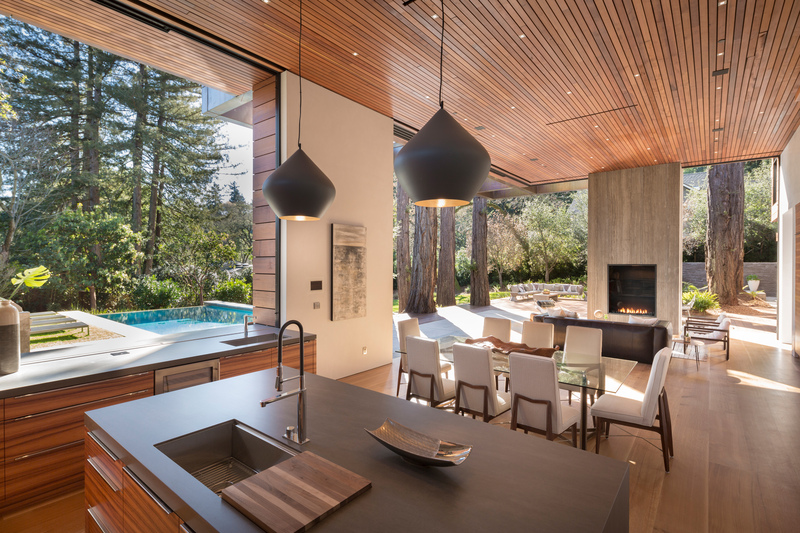 Gorgeous copper lights are suspended over the center island. 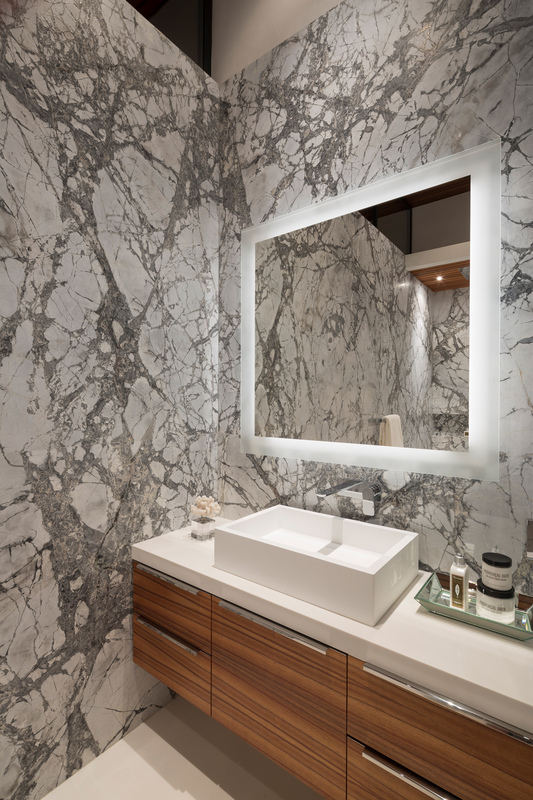 All counter tops are of Grey stone. The center island has an oversized stainless steel sink with high-end fixtures and offers casual counter seating. A second prep sink is located on the side counter over the wine refrigerator. 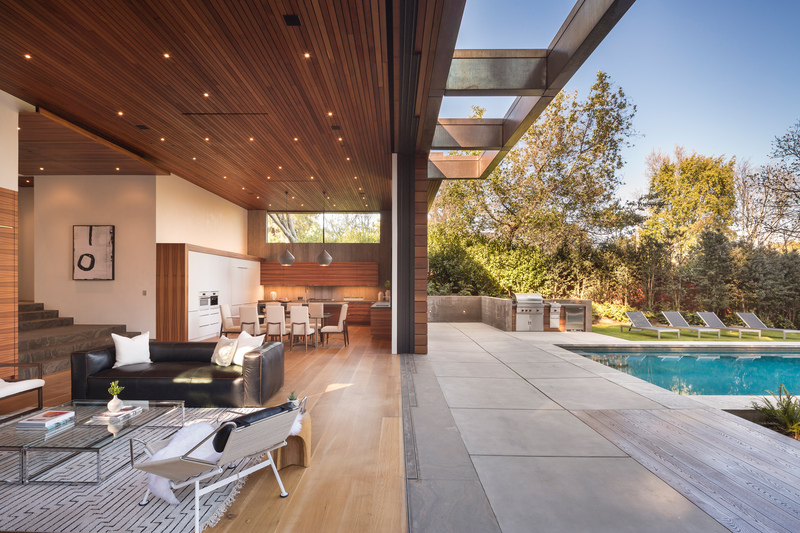 A 10-foot high sliding pocket window over the side counter completely disappears revealing a convenient pass-through to the exterior for serving family and guests on the pool patio or passing grillables to the outdoor kitchen BBQ. The butler’s pantry is essentially a second kitchen that is hidden conveniently behind the main kitchen, a requisite for grand scale entertaining. Double Miele ovens and warming drawer, a four-burner Miele gas cook-top, Miele refrigerator and second dishwasher make this the ultimate prep kitchen. The custom built-ins offer great pantry storage. 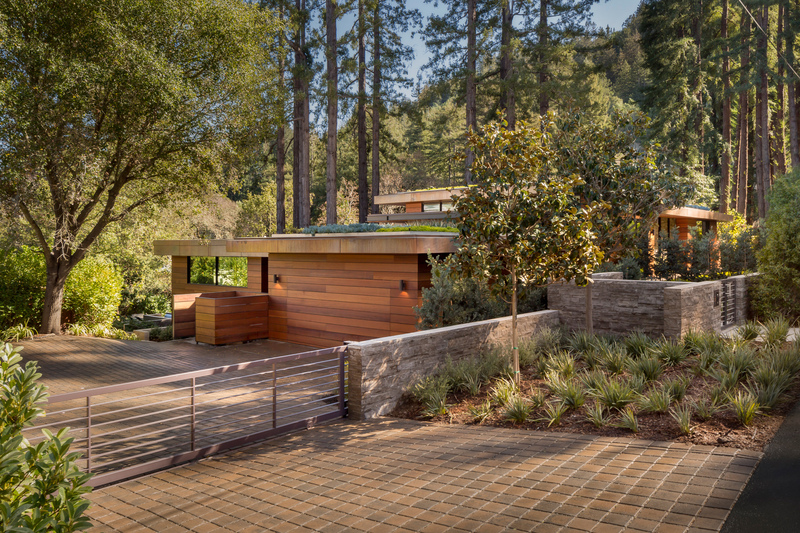 A side door to the exterior is ideal for separate caterer access to the outdoor entertaining areas. 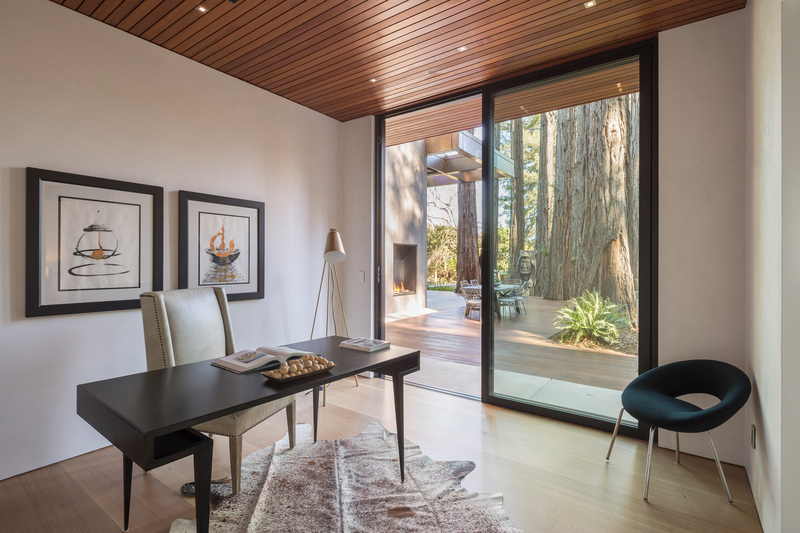 The family room and main floor bedroom wing are easily accessed from the great room. 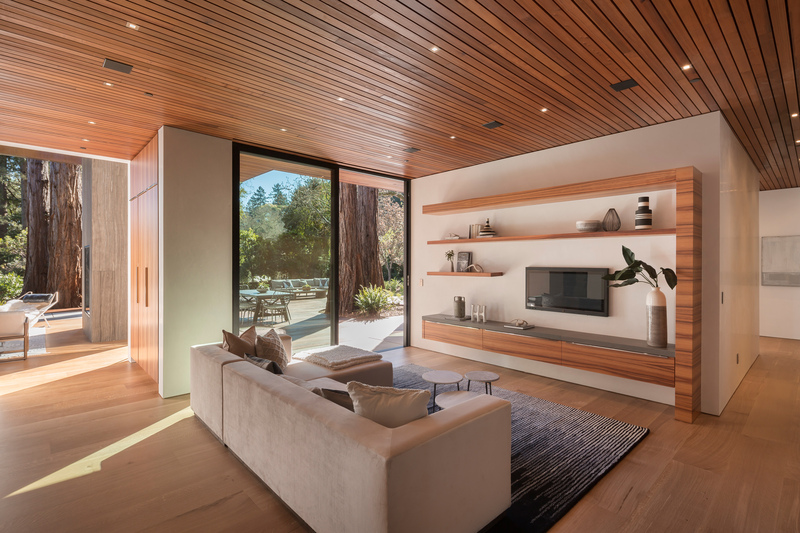 A beautiful built-in Koa entertainment center is the focal point of the room. 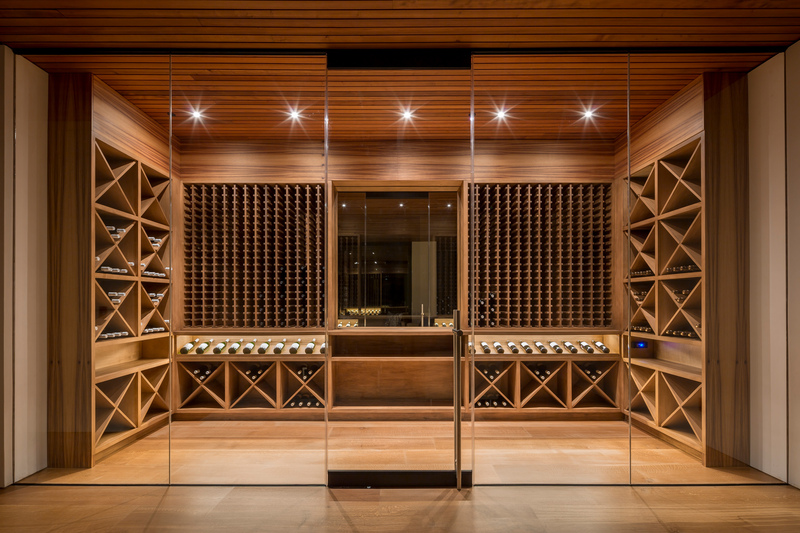 A glass wall at the rear of the room houses a 1500 bottle temperature controlled wine room. 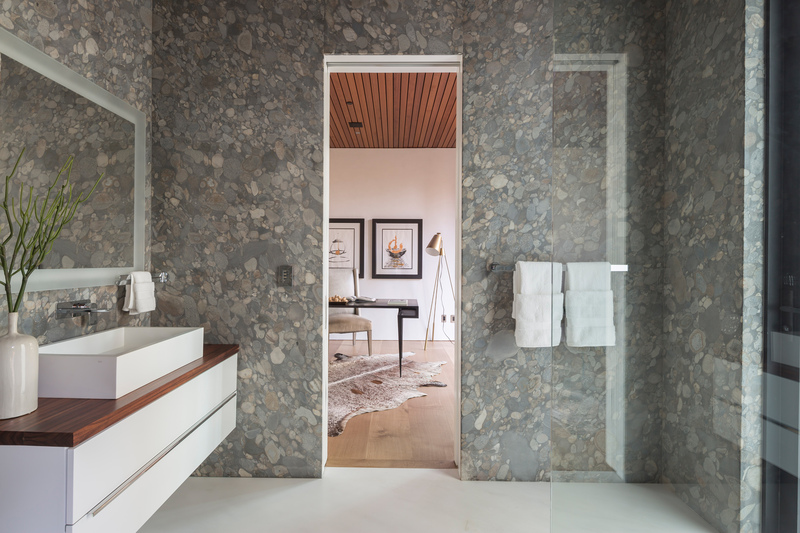 Down the hall is the laundry room and two bedrooms that share a central bathroom finished in gorgeous prehistoric river rock slab. 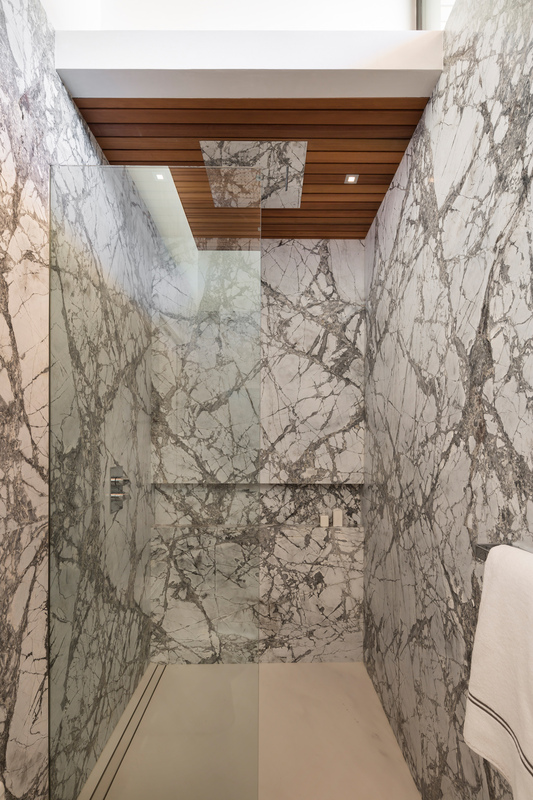 This bathroom doubles as a changing room for the pool, which is just steps away. 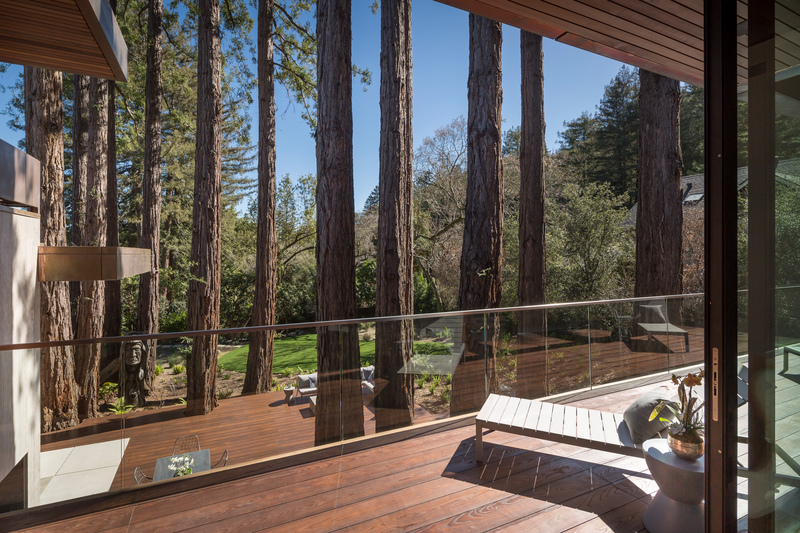 Both bedrooms have sliding glass doors that open up to the redwood grove, pool and decks. Ascend the stairs from the entry hall to the upper bedroom wing. 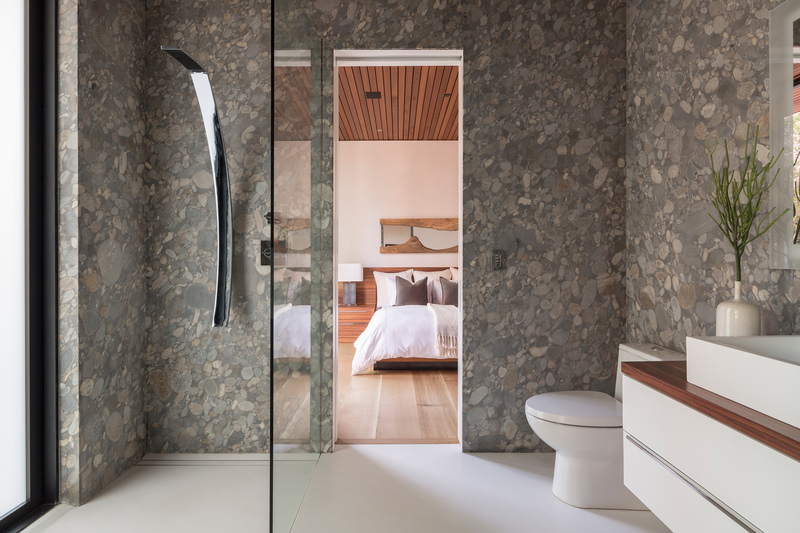 Two generous en-suite bedrooms feature high ceilings finished in redwood and stunning bathrooms with imported stone slab walls and Koa wood vanities. 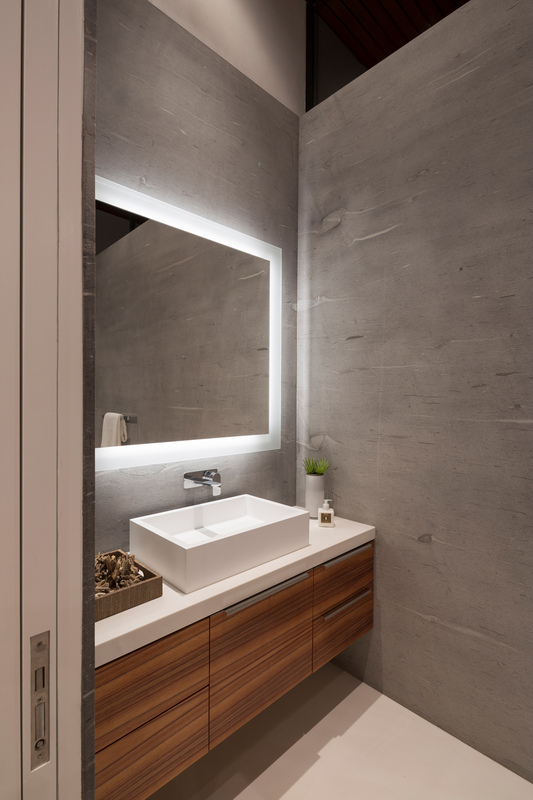 The hallway is finished in Venetian plaster and has gorgeous built-in Koa linen closets. 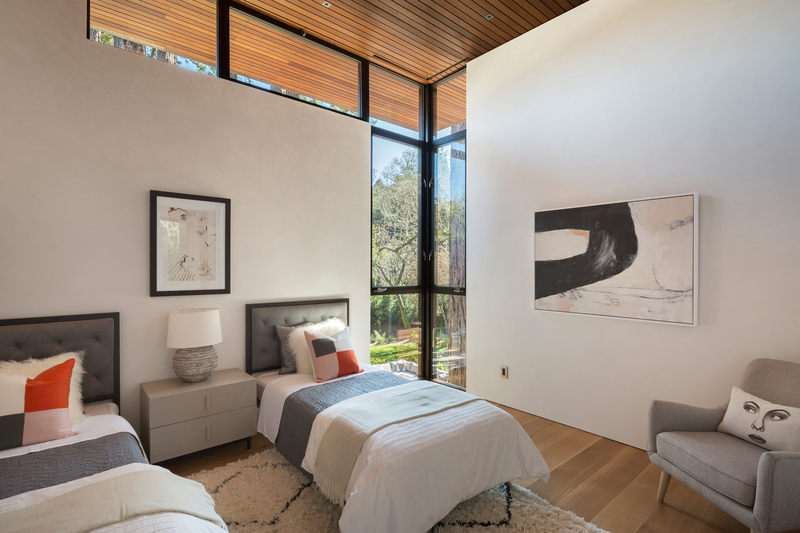 The master suite is a tranquil and spacious 804 square foot space thoughtfully designed as a luxurious private retreat. 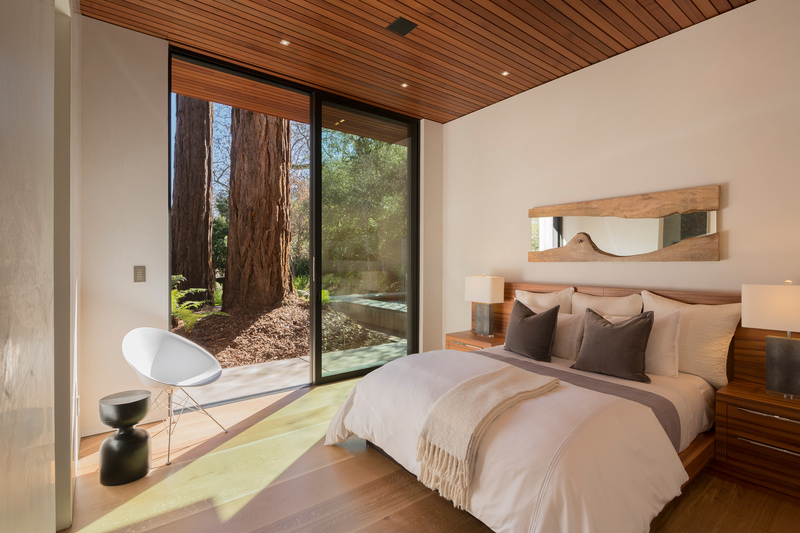 A bespoke Koa wood bed floats in the middle of the bedroom ideally positioned to wake up to a view of the redwoods through twelve foot sliding glass walls that open to a large private deck. 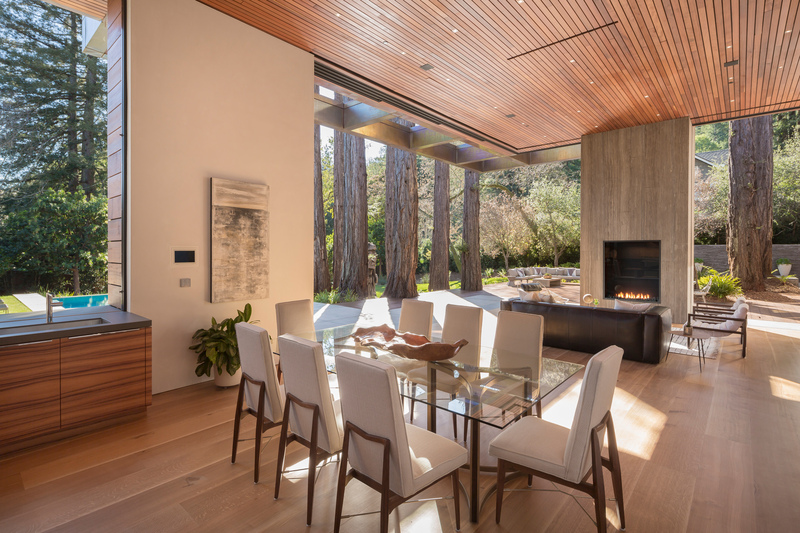 Redwood slat ceilings, wide plank oak floors and white plaster walls complete the space. 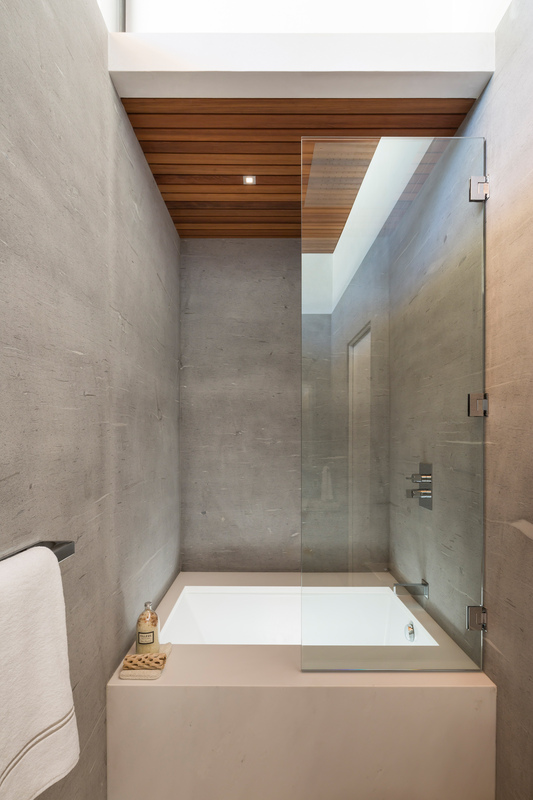 The bathroom is finished with elegant limestone slab walls and clean white stone floors. 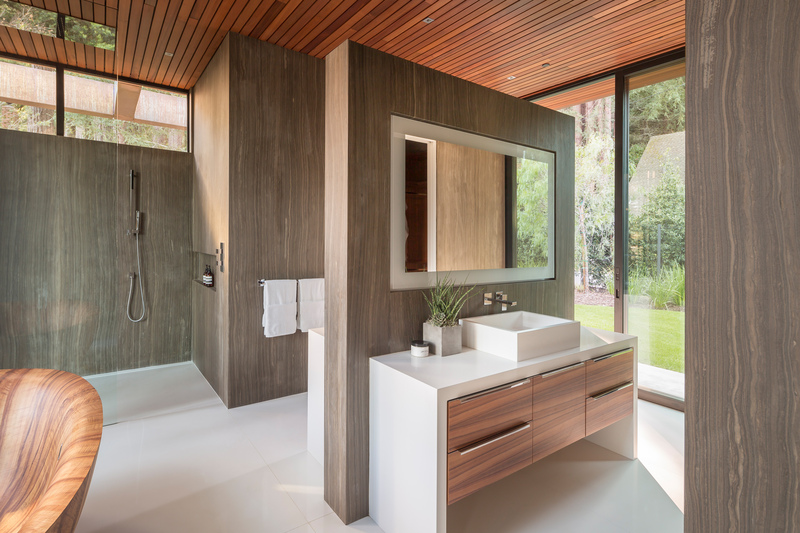 A spacious open rain shower is next to a custom formed Koa wood bathtub imported from Switzerland. 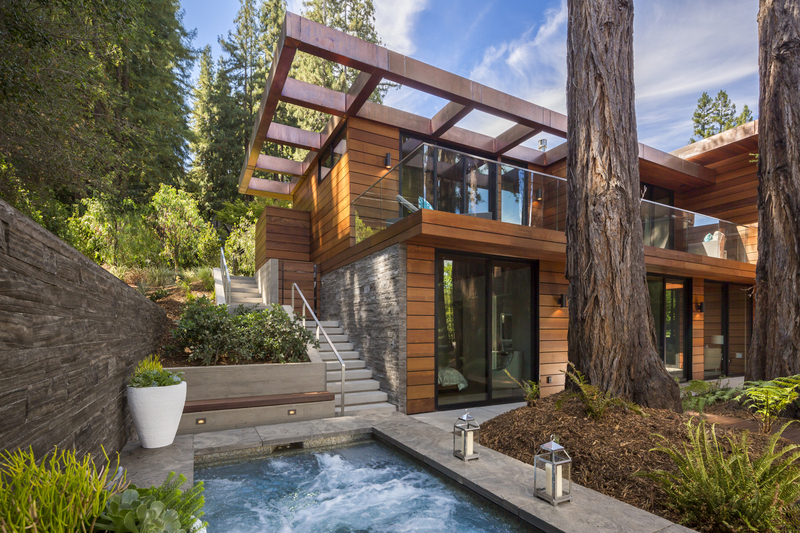 The twelve-foot doors near the tub open to the deck, creating a seamless natural sense of bathing outdoors. 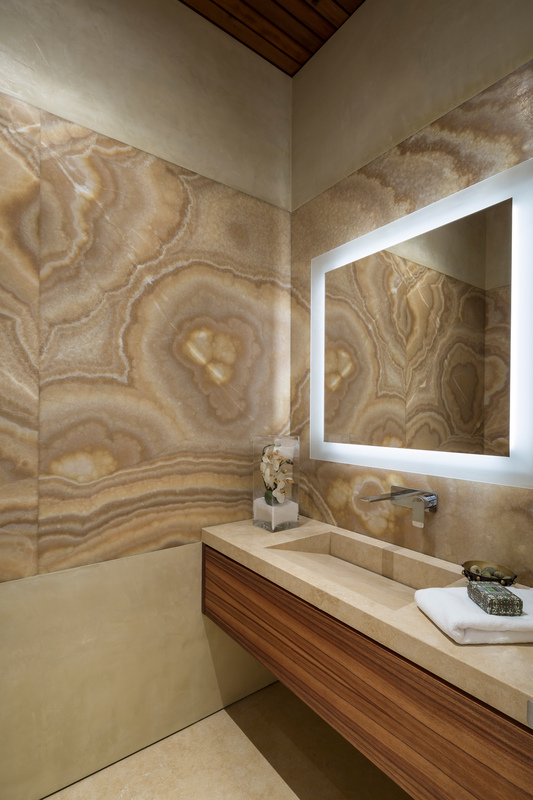 Double walk-in closets are separated by two-sided vanity island with Koa wood cabinetry and stone counter tops. 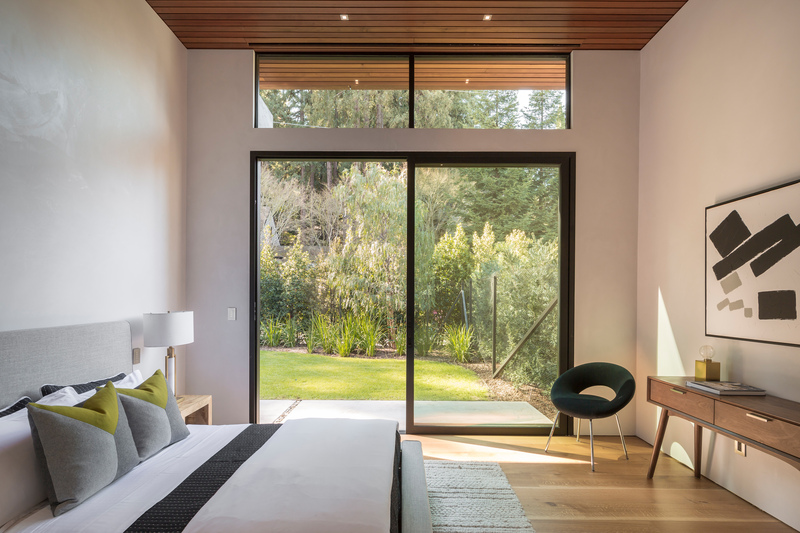 A sliding glass wall opens up onto a private yard area. 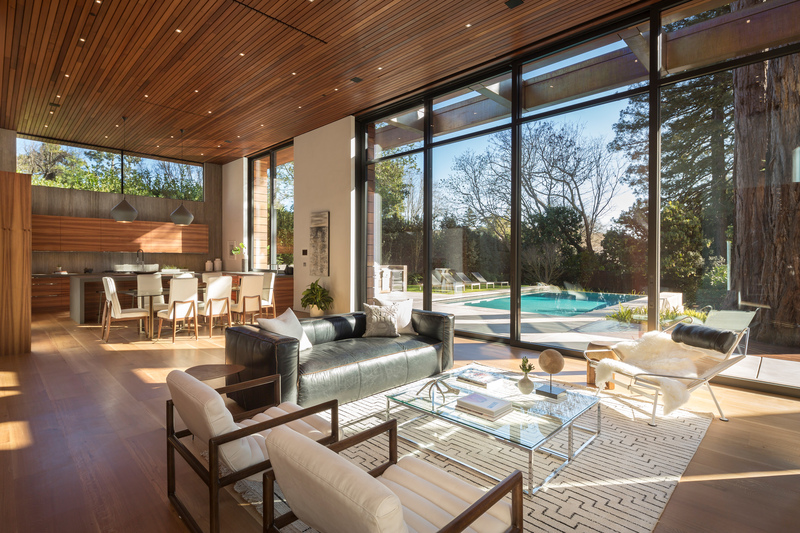 State of the art full home automation is provided by Control4 and Lutron systems. 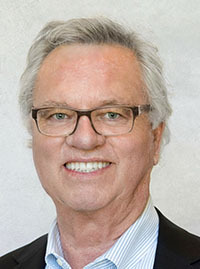 This fully customizable system offers owners the ultimate flexibility. 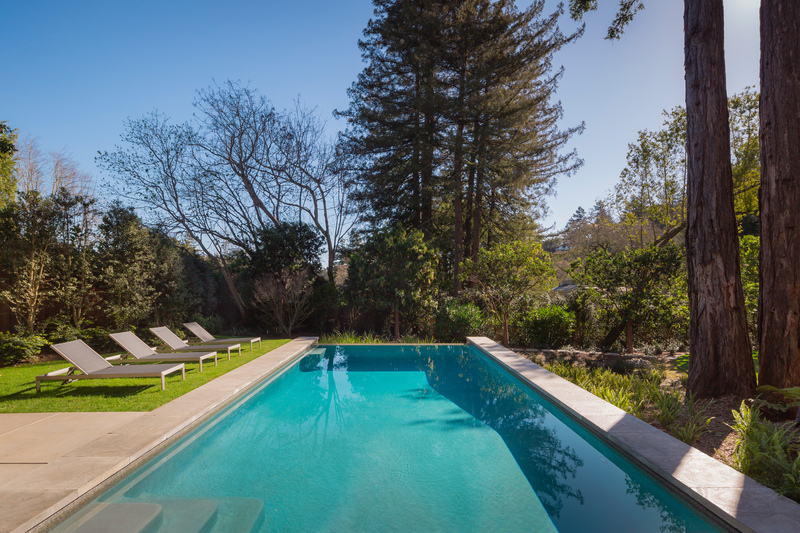 Everything from the pool heater and full home heating systems to the lights and entertainment systems are at your fingertips.